A few inches of snow cover the sidewalks and a mug of warm black tea is an evening necessity. The fewer hours of daylight make the nights grow long. I check the clock frequently, wondering why time appears to be passing faster than the hands on the clock read. At long last, winter is upon us. The feeling is still fresh, a seasonal novelty. For now, it suits me just fine. Even though Thanksgiving is only a week away, I could swear that it was nearly Christmas. I fear I am the latest victim of "Christmas creep," the idea that the early exploitation and over-commercialization of Christmas makes it feel as if it is just around the corner instead of an entire month away. With sugar cookies on the brain and a Netflix queue of holiday movies, I knew I needed to do something drastic, lest I grow tired of the holiday season before it had even begun. And so, I pushed aside thoughts of the holidays, pulled the flour out of the cupboard, and made myself an old-fashioned pumpkin pie. There is nothing more reminiscent of Thanksgiving than a large slice dolloped with whipped cream. I may not be able to stop the "creep," but I do have the power to claim back Thanksgiving as my own. This pumpkin pie is dairy-free, although you would never guess it. I have been dreaming of this pie long before the leaves fell from the trees, but I waited until the time was right to take it for a spin. I substituted the butter in the crust with dairy-free margarine for a flaky texture (Earth Balance is my personal brand of choice). Instead of heavy cream, I used full-fat coconut milk. I worried that the milk would lend a subtle coconut flavor to the final product, but it is completely masked by the pumpkin and spices. This pie truly tastes exactly like its dairy-filled counterpart, which is an accomplishment of its own. I shared this pie with my coworkers for a Tuesday lunch dessert. Even unadorned, the entire pie disappeared in short time. One coworker shared that this was the best pumpkin pie she has had since her grandmother had passed away many years ago. To me, there is no higher compliment this pie can receive. This dairy-free pumpkin pie will be a hit whether or not its "secret" is revealed. The filling sets up well, but still manages to retain a light texture. 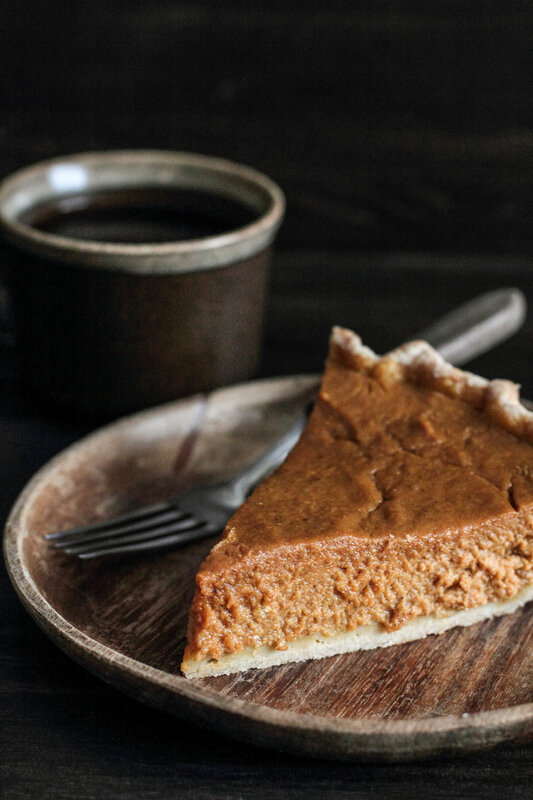 The pie is spiced primarily with cinnamon and ginger, which complement the pumpkin nicely. Serve warm or chilled with a dollop of coconut whipped cream.